Home › Blog › What should I do after the high voltage cable is wet? What should I do after the high voltage cable is wet? After the power cable is damp, it is heated and dried by a large current generator to improve the insulation resistance of the cable. In this special case without a large current generator, we can use a few AC welding machines on hand instead of a large current generator to dry the wet high voltage cable according to the working principle of the AC welding machine. The AC welding machine is composed of a step-down transformer reactor welding wire lead welding tongs, etc. The function of the step-down transformer is to reduce the AC voltage of 220 volts or 380 volts to a safe voltage of 6070 volts, and the current limit and regulation of the reactor The role of the magnitude of the welding current. When the welding tongs are in contact with the weldment, the voltage between the welding tongs and the weldment is from 6070 volts to 0 volts. According to the formula 1 = 130, the voltage is inversely proportional to the current, so that when the voltage tends to zero, The current tends to infinity, and the reactor connected in series in the loop limits the increase of the current, so that the reactance of the reactor can be changed to adjust the welding current. By utilizing this characteristic of the AC welding machine, the low current output of the ordinary AC welding machine is used instead of the large current generator to generate a large current generator. 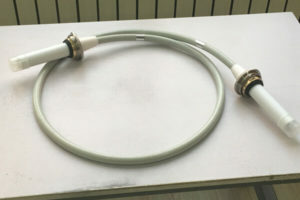 The damage of the high voltage cable connector is common. It is easy to fire. The high voltage cable discharges to the outer casing. 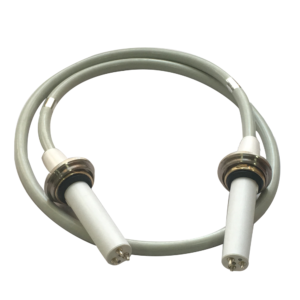 When the high voltage cable connector leaves a discharge, the insulation will burn out. It can not be used continuously. 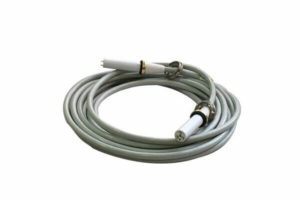 Generally, in addition to replacing the high voltage cable connector, the entire cable is replaced. And the socket on the tube; once processed an imported x-ray machine, because the equipment is running urgently and the imported parts cycle is too long, and finally use the grinding drill of the dental technician, carefully use the small grinding wheel on the joint Grinding, cleaning and drying, the ground surface is covered with 502 glue, dried, and installed according to the normal high-voltage cable installation requirements. 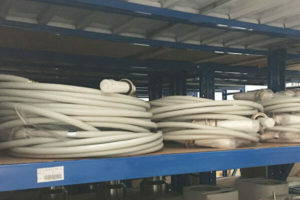 The treated cable is fully qualified for normal operation. If you would like more information about Newheek high voltage cable, please contact our customer service.